Individually the PS4 and Xbox One are PC architecture, but they don't play well together. Bethesda's Pete Hines is looking forward to developing on the new consoles. The PS4 and Xbox One are basically high-end PCs, as far as the architecture goes, making both machines much easier for developers to work with. But cross-platform? "They don't all play with each other," says Hines. "Xbox One is its own thing and PS4 is its own thing. The whole cross-platform thing is just a nightmare." Not a good position to be in, if you happen to be the folks bringing The Elder Scrolls Online to all the new consoles simultaneously. Imagine running completely separate servers for each machine, just to avoid a cross-platform train wreck. Previously the separate servers issue was put down to PvP problems but, while it probably plays a role, PvP might not be the only reason for putting separate servers out there. At least Hines likes the Xbone. "It's a nice robust machine that allows to do lots of cool stuff and put more cool things in the game," says he. But of course, practice makes perfect, and Hines knows full well that it will take time to master all the new tricks the Xbox One gives Bethesda access to. "The further forward we go, the better and better it's going to be." 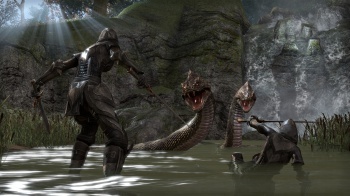 The Xbox One and PS4 are due late 2013, while Elder Scrolls Online has a projected release of Spring 2014.